In the sequel of the first part of the MLS tactical report, our author analyzed Seattle Sounders at Chicago Fire out of the third matchday, together with New York City FC at Toronto FC (Matchday 4) giving special attention to Alejandro Pozuelo’s incredible MLS debut. 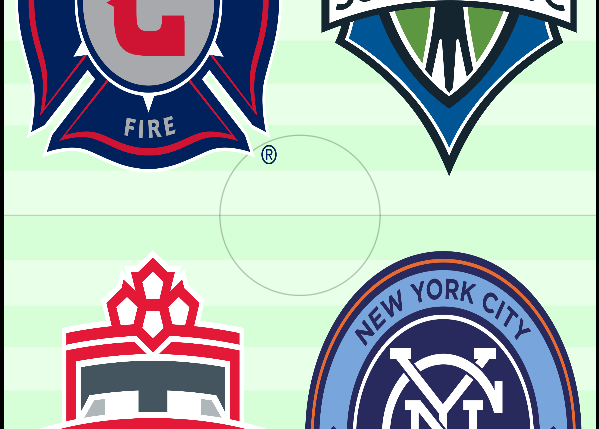 The Seattle Sounders met with Chicago Fire to start the third matchday of the MLS. Despite the six goals overall, the game was everything but high-class in tactical regards. Regardless, the guests deserved to take the victory, whereas Chicago at least showed some interesting formational adjustments and processes in possession. The head of the Chicago Fire team is without any doubt the former German national team captain and FC Bayern legend Bastian Schweinsteiger who dictates the rhythm as the linchpin in possession. They started the game in their flexible 4-1-4-1/4-3-2-1/4-2-3-1- formation with Nicolas Hasler replacing the suspended Jorge Corrales as left-back, whereas young Polish international Przemyslaw Frankowski did the same with Aleksandar Katai at the right offensive midfielder position. A clear 4-2-3-1 was used by Sounder’s coach Brian Schmetzer. He didn’t make any changes in comparison to the victorious play against the Colorado Rapids the week before. Captain and key player is Nicolas Lodeiro who, again, was also the difference maker in this match. 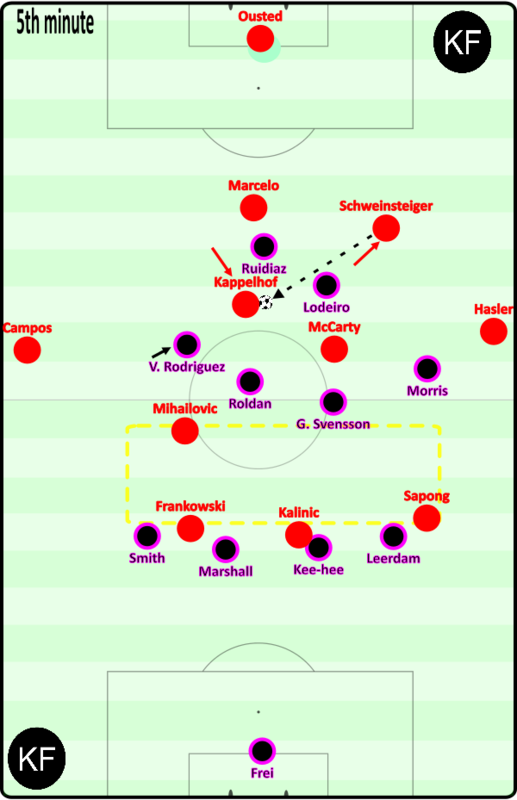 Chicago’s build-up play was denoted by a certain verticality, thus, a lot of long balls from the center backs Marcelo and Johan Kappelhof into the path of the offensive wingers Frankowski and Sapong. The two last-mentioned positioned themselves in the half-spaces were the often also dedicatedly dribbling center backs tried to find them with low passes. The goal was obviously to get the ball quickly into higher spaces. When they lost the ball in those spaces their counterpressing was really ambivalent and unstable as it usually didn’t enable them having access at the ball-winning Sounders. The central midfielders made quite wide-ranging movements. One out of the two routiniers, Dax McCarty and Bastian Schweinsteiger, frequently dropped back diagonally into the defensive chain or in between the two center backs, whereas the other, then, tried to build connections into higher areas with the help of the other midfield player, Djordje Mihailovic. The young American, at the beginning of the game, acted as a hybrid of a No. 8 and a No. 10 but also balanced the movements of his fellow midfielders in deeper areas. Also visible were clear 2-4-staggerings with McCarty and Schweinsteiger in the central spaces in front of the center backs and at the same level as the full-backs, plus, Mihailovic in the No. 10 space. Leader Schweinsteiger showed, while generally being focused in Fire’s possession game, spacious movements nearly all over the pitch with special emphasis on and around the left half-space. In the graphic above, a typical movement from Kappelhof is displayed as he was, throughout the match, occasionally pushing higher into the No. 6 space, when one out of “BS31” and McCarty dropped back into the defensive line, and simultaneously calling for the ball. In this scene he played a slightly delayed one-two with the German. The Dutchman’s movement slightly reminded me of the center back usage of Holstein Kiel, a club out of the second German division and definitely one of the most tactically entertaining professional one’s in Germany. Their coach Tim Walter is a forward thinker in this regard, even though his approach is much more unorthodox and way riskier as Chicago’s. Striking in the graphic is also the lack of vertical compactness of Seattle’s 4-2-3-1-midfield pressing which gave rise to a big space between the lines- a constant problem for Seattle within the game. The execution of it was position- and ball-oriented in comparison of being strictly man-orientated like a lot of other teams in the MLS. Even during attacking press phases they held on to their 4-2-3-1, only situationally and individually using ball-near orientations (e.g. in the 12th minute: Roldan oriented himself on Mihailovic when the latter occupied the No. 8 space). Despite that, it missed intensity and failed to isolate the opponent on the wings. Furthermore, the passiveness led to the team being easily pushed back when one of Chicago’s center backs dribbled aggressively forward. The ball-near (positionoriented) attacking movements were similar to the ones of the home team. In higher areas, Chicago used a 4-1-4-1-pressing with McCarty as holding midfielder plus Schweinsteiger and Mihailovic as No. 8s. There were also 4-2-3-1-staggerings with a deeper Schweinsteiger advancing in the following to create the known 4-1-4-1. In deeper midfield, the pressing formation changed more towards a 4-4-1-1. 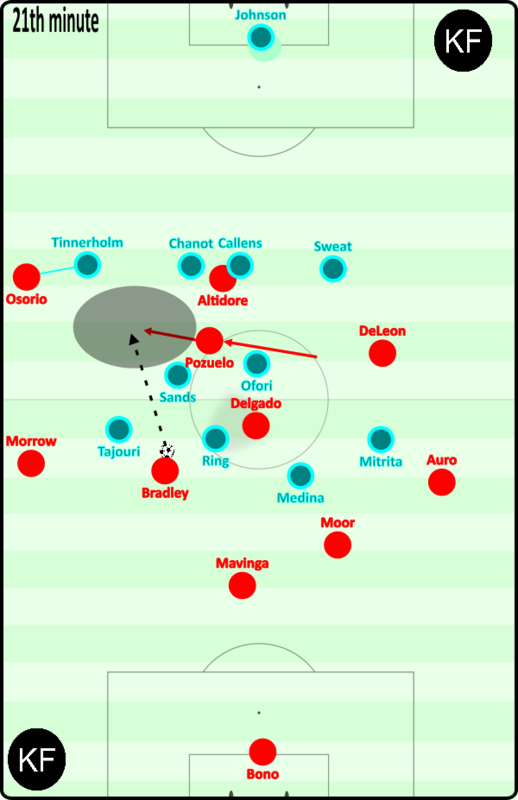 In general, as mentioned above, the pressing principles of both teams were fairly similar, as Chicago also defended very position-oriented, hence, shifting in a block without clear man-orientations as well as pushing up to attack the ball-carrier. Referring to the last part of the sentence befor: as the ball-nearest player attacked the ball-carrier there weren’t any effective group-tactical (not to mention team-tactical) processes which would support or amplify those individual actions. That was the reason Chicago struggled to gain access against the ball. Regarding the attacking pressing, Kalinic, the pressing forefront, functioned as a “wedge” forward as he attacked the ball-holding center back using his cover-shadow with an arcing run to block passes to the other center back, thus, guiding Seattle’s attack to the side. What can often times be a good tool to isolate the opponent on the wing, requires coherent team-tactical procedures to accomplish that. For the home side, that wasn’t the case at that day as Seattle could hold on to the ball comparatively without major stress. The dynamic guiding of the opponent towards the wing was also executed with 4-4-2-staggerings within attacking press moments, but with the characteristic (fine) adjustement problems (especially in terms of shifting). Most of the time, the Sounders built up in a, what you could call “standard stagger” of their 4-2-3-1- formation, with the two No. 6s, Roldan and Svensson, infront of the two center backs , Kee-hee and Marshall. They showed a calm, more ambitious focus on short passes and, as mentioned already, were able to resolve situations in which Chicago piled up the pressure with low passes instead of clearing it long and wide. At the beginning, Raul Ruidiaz and, mainly, Nicolas Lodeiro dropped back into the deeper half-spaces. These movements were answered by Kappelhof and, more times, Marcelo, with wide-ranging followings. Seattle dominated the start of the game by creating a lot of chances. Almost every time the spacious and creative Lodeiro was involved then. In the 7th minute (see graphic below), the Uruguayan “tilted out” to the left hand side. He found Ruidiaz who was given lots of space in between Chicago’s lines. The Peruvian international passed it to Morris who afterwards assisted Victor Rodriguez, marking the early lead. A simple play but Fire was struggling anyway. 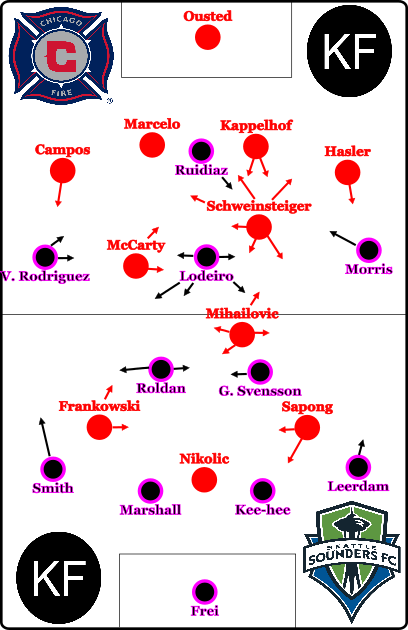 Most of Lodeiro’s wide-ranging took place on the left side, in which those were embedded into assembling real synergic effects with the left full-back Smith and goal scorer Rodriguez, using the 3rd-man-concept. It was used continuously, through the first part of the first half, causing danger mostly via wing breakthroughs of Smith. In the 15th minute, Frankowski lost the ball in midfield against Svensson. Seattle could keep the football, even though Chicago’s counterpressing was alright in that situation. Lodeiro then passed it to Morris who sprinted diagonally behind the advanced defense and scored by lobbing it over the stormed out Ousted. Already trailing with two goals after a quarter of an hour, Chicago didn’t seem to find a way into this game. So Coach Veljko Paunovic, roughly at the middle of the first half, decided to change their formation into a 5-4-1 against the ball and a back three as stance in possession. Bastian Schweinsteiger was now permanently the central part of the defensive chain of three (only once temporarily the right half-back as he switched with Marcelo). 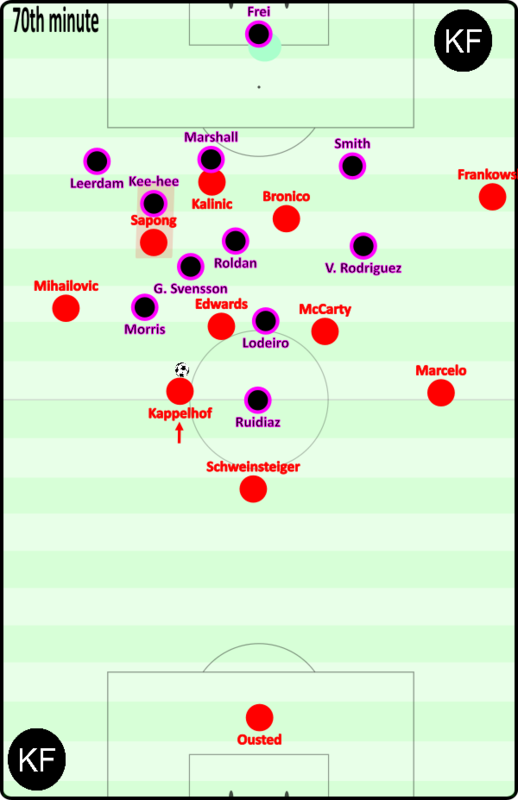 The quantity of spacious man-oriented anticipations of Kappelhof and, especially, Marcelo, was raised as there were an increased number of players to balance/ safeguard those. Furthermore, their 5-4-1 was executed with more strict man-orientations by the two central midfielders, McCarty and Mihailovic, towards Roldan and Svensson, inducing unclean structures. Positive side note: Schweinsteiger’s intelligent anticipating actions. In possession, the half-backs dribbled even more swingingly. Mihailovic was positioned a little deeper than before, yet, in average still higher than McCarty who often times supported the back three by adding on to the numerical advantage in the first line (3 v 2) and creating diamond-like structures. Therefore, Seattle was denied to exercise (any hampering) pressure. Frankowski and Sapong were still focused as the latter-mentioned was mostly involved through long balls by the central defenders. When reaching the halfway line, across the board, Schweinsteiger oriented himself towards the left half-space, particularly within the last third. Speaking of higher areas, Chicago’s counterpressing improved a mite while generally earning, only slightly though, more game control. Nevertheless, the Seattle Sounders remained the better team, patiently keeping possession also in Chicago’s side of the field. Besides the 3rd-man-movements on the left side, they were missing coherent group-tactical processes to further damage the unstable home team. As a reaction on Chicago doubling down on the man-orientations -which they did, presumably, to enhance their defensive access- for example, at the 36th minute, Seattle’s Roldan swerved to the left side to act as a left full-back. They didn’t allow much in defense either as the opponent’s biggest chances were Frankowski’s shot from distance after a corner, and a good half-space dribbling from Raheem Edwards who was substituted for Hasler in the 36th minute as he fits the wing-back role more. Before Edwards’ shot, the team of the “windy city” featured effective post-counterpressing movements to generate pressure on the ball. Just short of the first half’s termination, the hosts made a small formational adjustment once again as Sapong acted like a second striker next to Kalinic. Asymmetric 5-3-2-staggerings occurred. To underline this adaptation, Paunovic brought in central midfielder Brandt Bronico for wing-back Campos at the start of the half. In the following, Frankowski took the wing-back spot at the right side as Bronico played as a No. 8 next to (McCarty and) Mihailovic. 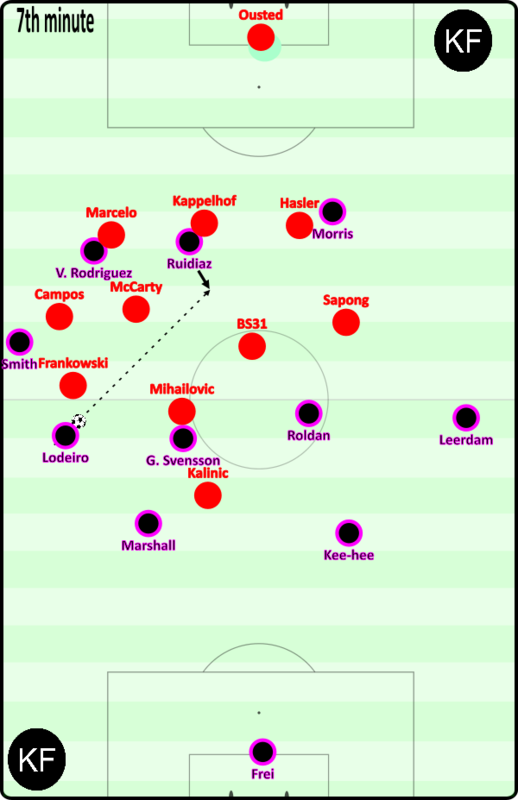 Nonetheless, as Sapong oriented himself deeper than Kalinic, out of the asymmetric 5-3-2-staggerings, also 5-2-3/ 5-2-2-1 ones were occasionally produced within the midfield pressing with Bronico and Sapong functioning like attacking midfielders. Initially, though, the first third of the second half was dictated by Seattle again. Despite the chances, Fire still failed to acquire collective processes to really hinder Seattle to hold possession. Seconds past the switching of the team’s sides, Ruidiaz denied himself to make use of a great chance by a bad first touch followed by missing (to hit) the ball. Only three minutes later, Lodeiro did it better and turned a penalty into account. 0-3. But the Sounders themselves were struggling during pressing phases inside the middle third or higher. Chicago’s half-backs, especially Marcelo could literally sidestep pressure of the attacking wingers by using simple body feints and, subsequently, dribblings (often followed by long balls). After the follow-up goal by Edwards (57th minute), which was rather coincidental as Chicago only procreated chances from distance and/or chances by accident because they lacked group-tactical processes in the final third, the home team performed better. In addition to Kappelhof moving into the No. 6-space, another interesting positioning could be observed as Edwards inverted often times into the half-space or even the center. 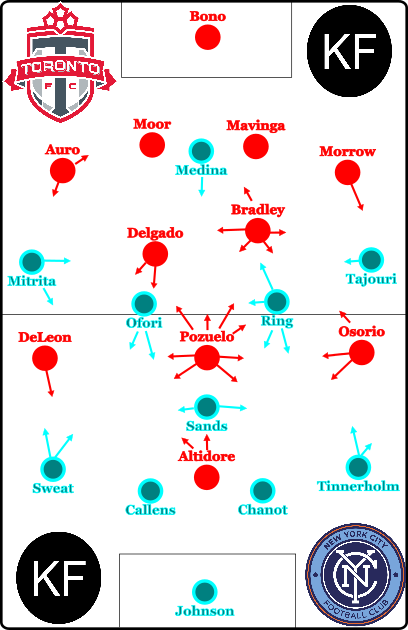 In the 70th minute, a typical build-up scene by Chicago was rendered in which you can point out the advancing, offensive half-backs and the foresaid Edwards calling for the ball in the center while Mihailovic occupied the left wing providing width. Edwards’ positioning, however, didn’t suit this situation as he was claiming the ball too dominantly. The game even got suspense-packed in the end after Frankowski, who was constantly involved in the final third, found the subbed-in Herbers who converted via a curious follow-up shot (84th minute). A typical action for Chicago today- keyword coincidence. Seattle, on the other hand, remained deeper defending the box with solid processes. To reinforce that, Roman Torres was brought in for Lodeiro in the 71st minute. Schmetzer changed the formation to a 5-4-1 adding to the numerical defensive strength, and, first and foremost, to defend the wings with two lateral players plus improving the ability to balance defenders who move forth out of the defensive chain. By the way, the suspense only lasted four minutes before Smith set up Ruidiaz to crush Chicago’s comeback hopes, with the aid of Ousted who came out of the goal being out in his estimation as well (88th minute). A lusterless Seattle deserved to win this tactically disappointing game due to having more stable processes in any of the four phases of the game. Chicago, in defiance of the early adjustment which led to Schweinsteiger covering the spacious half-backs while generally trying to organize the team during all phases of the game, suffered from squalidness in the passing game and a half-baked positional play. In a general sense, the match was embossed by a little number of scoring opportunities, a low intensity and very little group- or team-tactical processes. Toronto FC played NYCFC at home as the newly-signed Alejandro Pozuelo made his debut for the Canadian side. Besides his two goals and one assist, the small Spaniard directly fit in very well filling his natural role of an omnipresent originator of structures by being spaciously combinative while generating connections on a team-tactical level. TFC-Coach Greg Vanney made three changes in comparison to last week’s tight 3-2 win against New England Revolution. Hamilton, Akinola and Chapman were replaced by Marky Delgado, Jozy Altidore and Pozuelo within their 4-2-3-1-formation. The guests out of the “Big Apple” used a 4-1-4-1 and exchanged thrice as well with Ben Sweat for Matarrita as left full-back, Ismael Tajouri for Castellanos on the right wing and young forward Jesus Medina for Moralez. During build-up phases, NYCFC displayed much higher patience by contrast with the match at Orlando as they were willing to take risks within the (short) passing game, refraining from hitting the ball long. In the early phases, they occupied the wings twice. Sometimes James Sands, for example, dropped between the center backs, so Ebenezer Ofori and Alexander Ring positioned themselves in front of the interfaces while the full-backs stayed on the wings and the wingers occupied the half-spaces. Especially the bustling Alexandru Mitrita was located mostly inside the left half-space trying to fuel the team’s advancement from there. His actions, on and off, missed cleanness and precision, though. 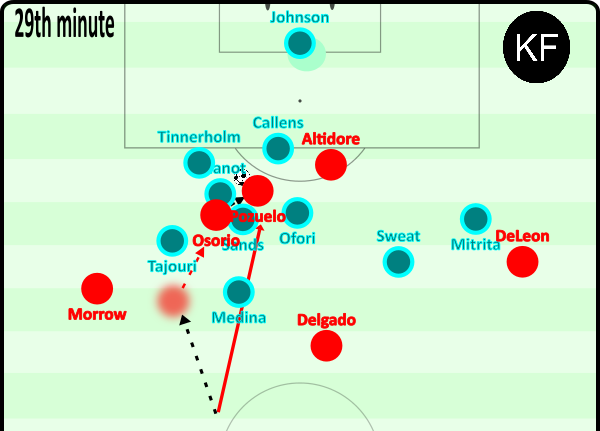 In higher areas, the full-backs didn’t just passively provided width but rather, in case of Tinnerholm, inverting widely into the half-space or the center when being on the ball-far side (see their first goal against Orlando), or, referring to Sweat, involving themselves in small-scale combinations. Both, in general, tend to use underlapping runs (especially Tinnerholm) or overload the higher half-spaces and/or the last line (especially Sweat). NYC’s positional play was, generally, fluid, so diverse staggerings evolved. Their counterpressing, on the other hand, was inconstant again as it touched off good with a smaller group-tactical level, but lacked coherence on a macro level. The biggest chance of the half had captain Ring when he moved up into the box to answer Medina’s drawing aside. Toronto’s approach against the ball was characterized by a 4-4-2-midfield pressing with asymmetric 4-2-2-2-staggerings in which the ball-near players oriented themselves relatively early and stringently towards their (nominal) opposing player (i.e. winger against opp. full-back, central midfielder against opp. No. 8, full-back against opp. winger) without using strict man-coverages. Situationally, it even appeared that they briefly mirrored the opponent’s structure on a slightly bigger scale. The ball-far players balanced those patterns accurately. Relatively rigorous, moreover, were Moor and Mavinga tracking Medina when he fell back. In lower midfield areas and inside the defensive third 4-4-1-1- staggerings occurred, including a wide shifting towards the side of the ball by the midfield chain. When the front of the defensive formation advanced and, thus, raised the pressing height, the defensive chain failed to move up as well. Consequently, the space between the lines became too big resulting in a volatile vertical compactness. Nonetheless, the home side’s pressing was effective and clean at the most, preventing New York from having lots of (auspicious) chances. At high pressing phases, out of the already mentioned orientation-patterns wide-ranged attacking runs were conducted, especially by Bradley who also pressed through as often as possible. Also Pozuelo was very active in those higher areas. His game intelligence can be seen also against the ball, so the first graphic of this article is dedicated to a defensive scene of his. When Bradley moved forth, Pozuelo recognized the slight structural imbalance, hence, dropping back into the midfield line. In the sequel, he even won the ball against Mitrita, of course also profiting from a technical mistake made by the Romanian. At the Canadian initial build-up stages, Bradley occupied the space close to the central defenders while Delgado positioned himself higher, particularly in the right half-space, but, always dropping back dynamically to offer an option within the passing game. Additionally, left center back Mavinga dribbled snappily forward when space opened up. Bradley, who himself was very dominant and tried to propel the team’s advance by spaciously moving (horizontally) around the first line. This normally leads to inconstant connections into higher areas as it requires an enormous communicational effort, exceedingly among the central players. As for their stable positional play and Alejandro Pozuelo, who was steadily (and successfully) underway searching to create links plus reinforcing the structure sustainably through clever subsequent movements (esp. in the last third), the ramifications weren’t drastic. One can’t stress the fact enough that Pozuelo only trained very few days with the team, yet, there existed already a certain harmony. Must be due to the exuberant game intelligence of the small, and incredibly nimble playmaker. Besides the spacious switch-overs in the deeper possession phases, an asymmetric distribution of roles of the lateral players was apparent. Generally, both fullbacks stayed deeper which, at times, led to double-staffed wings. Also visible: the ball-near fullback positioned himself wide and the ball-far one lingered at the same height like the center backs. 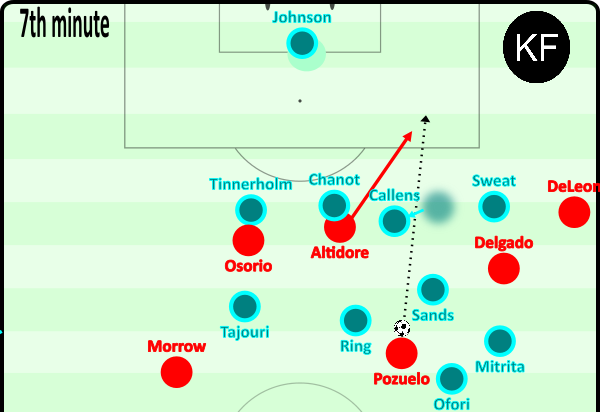 Basically though, Auro remained deeper and close to the center backs while left back Morrow was involved in much higher spaces plus providing width as Jonathan Osorio drifted constantly into the half-space or center. On the right side, Nick DeLeon remained wide, only rarely inverting inside. Toronto’s constructive offensive approach included, by the side of Pozuelo, Jozy Altidore who, when being close to the ball, dropped back often into the space between the lines to involve himself in combinations, Osorio swinging between the two half-spaces and the moving up Delgado. The usually good group-tactical moments when possessing the ball also resulted in a fine counterpressing. Peculiarly within the second counterpressing wave inside higher areas, Delgado and the untiring Bradley pushed up aggressively (and risky). Welcome to the Pozuelo show! In the 7th minute, Pozuelo called for the ball from Delgado in front of the opponent’s midfield line. After receiving it, he turned himself quickly, a tool he often uses to dissolve pressure, to then play a perfectly timed, very empathetic through ball against the shifting movement of the defense to Altidore, allowing him to have the first opportunity of the match. Sean Johnson saved the shot. One of his many far-ranging movements, which is one of his tools by his natural desire to steadily create favorable structures, was seen in the 21st minute when he recognized the opportunity to play on the left half-space between New York’s lines. Bradley failed to deliver an accurate pass, though. New York’s 4-1-4-1- midfield pressing, including 4-4-1-1/ 4-2-3-1/ 4-4-2- staggerings through an advancing Ring, entailed situative man-orientations, especially from Ring towards Bradley. In contrast to the first matchday against Orlando, NYC-Coach Domenec Torrent relinquished the 5-4-1 with Sands dropping back to be the central defender as the formational remodeling processes led to problems regarding (vertical) compactness. Also the man-orientations, especially by the two No. 8s, weren’t as strict as back then, but instead more loose and flexible. When the center backs pushed up into the space between the lines, they did so very properly. In higher areas, Medina served as the “wedge” forward (see Kalinic at the analysis of Chicago v Seattle) and used his cover-shadow to block central areas whereas their Finnish captain Ring showed some good timing in his attacking runs, also pressing through towards the keeper. In the 24th minute, Toronto easily played around the 4-1-3-2-attacking press of NYCFC, directly gaining a lot of space through Morrow. As he dribbled, Pozuelo, already considering the vast space and potential numerical advantage on the yet ball-far side, pointed him to pass the ball to Osorio, so that the Canadian could lay it off to him. After that happened as planned, the Spaniard played the football to DeLeon, subsequently starting an opponent-binding plus space-opening run. Unfortunately for them, Pozuelo deflected DeLeon’s following shot which found the way into the goal, while being offside. Rightly, the goal was denied by the referee. After a cross by Sweat, NYC turned the ball over, answering it with a weak counterpressing which allowed Toronto to secure the ball via Bradley and Pozuelo and to start the counterattack. When the ball reached midfield, the latter upped the tempo by playing a sharp pass to Osorio, followed by an intense vertical run as he perceived responsibility to support Osorio immediately up high in this short-handed situation. Osorio, then, returned it to the fastly advanced “combination monster out of the future” (that’s how colleague Martin Rafelt refered to Pozuelo in an article about him at spielverlagerung.de out of the year 2014 (in German)) who dribbled past Tinnerholm by maintaining orientation to eventually pass it to the wide-open Altidore. The US-American forward legend hit it home without effort, deservedly making it 1-0 for the home team. This scene arrestingly highlighted a variety of Pozuelo’s unique skills: inducing connections, strong passing execution, combinational focus, incredible group-tactical intelligence in and around the box including a massive penetrating power, and an outstanding orientation ability within most complex situations. All while being found all over the field. When he situationally provided width, he always combined himself dynamically into more central areas. At half-time, NYCFC made some adjustments. Formational-wise, and beyond of pre-existing tendencies at the first half, a clearer 4-2-3-1 with Ring as No. 10 in front of a double-six was observable (Yet, there were still also 4-1-4-1-staggers, next to 4-4-2 ones, within the midfield pressing). Furthermore, in the context of positional changes, Medina was now the winger on the right side, Tajouri on the left side, and Mitrita filled out the forward role more as a False 9 by constantly occupying deeper areas. In principle, the offensive lateral players provided width while the fullbacks moved into the half-spaces. To further strengthen the offensive, at least nominally, New York used the first substitution relatively early in the second half, replacing Ofori with the forward Valentin Castellanos. As part of this change, flexible Ring stepped one line back to fill in Ofori’s former spot as a No. 6, as did Mitrita with the now vacant No. 10 position. An interesting staggering emerged when NYC started to build up a new attack after getting stopped on the left side by Toronto despite neat rotations within the fluid positional play. Here, they neglected the No. 10 space, at once being arrayed too flat. TFC generated some rhythm changes against the ball, e.g. situationally obstructing all build-up players of New York with man-coverages during their high press. That led to a NYC-chance for Mitrita though, as the guests were able to take advantage of this (passive,) opponent-focused approach by starting a fast-attack and using the opened up spaces (47th minute). Generally speaking, the Canadian’s compactness was solid, and therefore not an issue at that time of the game, especially not at deeper areas. The ongoing dominance of Toronto eventually led to the 2-0 in the 59th minute. Altidore, who, overall, made good, adequate lay-offs when dropping back into the space between the lines, was fouled by Callens inside the box, giving Pozuelo the occasion to score on his debut via penalty. Befitting his rank, he did a Panenka. In the scene above, Auro pounded the ball long line into Pozuelo’s diagonal route to the right side. Instead of simply hitting a dull cross into the box, “Poz” used a subtle delaying moment in order to pass the ball smoothly into the now enhanced structure to unfold an almost perfectly performed group tactical process. 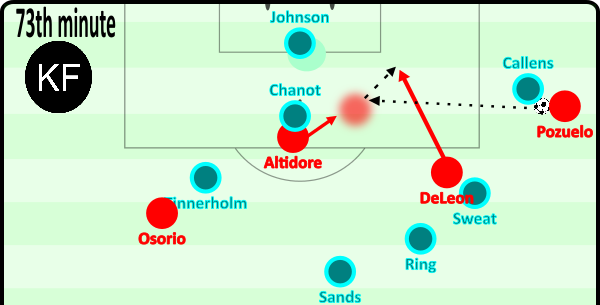 After DeLeon underlapped Pozuelo inside the half-space, Altidore played a one-two with the winger, only to miss out on an almost certain expected goal. Four minutes later, he didn’t turn another one to account, once again being played to the gallery by the distinguished Pozuelo whose entire brilliance became especially evident for everyone in the 78th minute as he finished a counterattack with a breathtaking lob over Johnson. There is really no need for much more words. If anyone still needed another (final) proof for the fact that TFC signed a very special player, here it was. Under standing ovations, the match-winner was taken off by Vanney for Jay Tyler Chapman. The sub eventually marked Toronto’s fourth goal following a great dribbling and through ball by Auro. Even though NYCFC came up with a better positional play plus improved defensive processes compared to the season’s start, they were still far inferior anyhow. In spite of causing some minor turnovers, Alejandro Pozuelo overshone anybody by permanently creating danger out of any kind of situation, thus, leading Toronto to the third win out of the first three games for the first time in their history.